Rachel was a gifted writer and observer. Following her death, her emails from Palestine received world-wide attention and inspired many people. 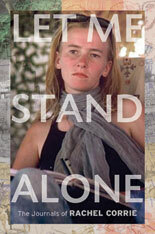 Those emails, and other pieces she wrote during her life, were turned into a theatrical play titled “My Name Is Rachel Corrie” and later published in a book titled Let Me Stand Alone. Edited by Alan Rickman and Katharine Viner. Directed by Rickman, My Name is Rachel Corrie enjoyed great success in London when it opened at the Royal Court Theatre in April 2005 and when it returned for an encore engagement in October 2005. In the spring of 2006, after the New York Theater Workshop halted production amidst controversy, the play moved to London’s West End for nine weeks at the Playhouse Theatre and also reached prominent summer theater festivals in Galway and Edinburgh. In addition to the Best Actress award, the play received the 2006 London Theatregoers’ Choice Award for Best Play and Best Director and garnered nominations for a Time Out Award for Best Actress, a South Bank Show Award for Best Production, and an Olivier Award for Outstanding Achievement. London actress Josephine Taylor was nominated for “Best Solo Show” at the Edinburgh Fringe, a sixty year old arts festival and the world’s largest. Megan Dodds, whose performance as Rachel Corrie received the London Theatregoers’ Choice Award for Best Actress, opened the show in New York. The part has been played more recently by Bree Elrod, Kerry Bishe and Marya Sea Kaminski. “One unexpected gift has been to witness the opportunity this role has given these outstanding, young, female actresses. 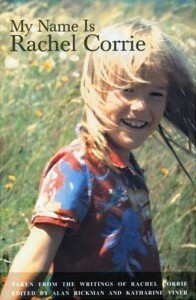 I believe this would please Rachel,” said Cindy Corrie, Rachel’s mother. My Name is Rachel Corrie touches on Rachel’s life from early days in Olympia, Washington, where she grew up, through her experiences as an activist in Gaza. Ben Brantley of The New York Times said “Rachel Corrie’s sense of the world gone so awry that it forces her to question her ‘fundamental belief in the goodness of human nature’ is sure to strike sadly familiar chords.” Cathleen McGuigan of Newsweek exclaimed, “Here is a play where the real dialogue begins when the curtain comes down. Visit the book website here. One young woman’s voice – intense and poetic – grapples with universal ideas as it chronicles a personal journey cut short. How do we find our way in the world? How do our actions affect others? What do we owe the rest of humanity? These are the timeless questions so eloquently posed by Rachel Corrie, a young American activist killed on March 16, 2003, as she tried to block the demolition of a Palestinian family’s home in the Gaza Strip. She was twenty-three years old.